If you are holding a special event at your church and considering hiring a jumping castle for children, it’s very important to be aware of the hazards, risks and safety requirements involved. Unfortunately on some occasions serious injuries have occurred where jumping castles were incorrectly set up or where supervision of children was lacking. Commercial jumping castles must adhere to Australian Standard 3533.4.1-2005 with regard to manufacture, design, operation and maintenance of inflatable devices. These standards stipulate that the device must be able to withstand wind speeds of up to 40km/h, and should be properly anchored to prevent it from being lifted by strong wind gusts. Other design safety issues referred to the in the Standard relate to material flammability, entrapment points, avoidance of sharp or hard objects, and the use of impact-absorbing material at entrances and exits. The Standard does not apply to jumping castles that can be purchased for private use as these come under the definition of ‘toys’. However it’s important to be aware that commercial operators can purchase and hire out these devices also. In any case, it’s important to have adequate safety procedures in place when hiring jumping castles. Before hiring, check that the jumping castle meets the requirements of the Standard. Get the device set up by trained professionals. According to WorkSafe Victoria, the largest risk involved in the use of jumping castle relates to their susceptibility to strong winds. For this reason make sure the device is properly anchored at all times. Avoid using jumping castles on very windy days, and suspend use if very strong wind gusts occur. Proper supervision is vital – make sure there is an adult supervisor at all times and that he or she is trained in the operation of the equipment. 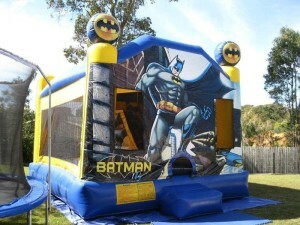 You might want to consider hiring a professional operator along with the jumping castle itself. Limit the number of users to reduce the risk of collisions, and avoid mixing age-groups of users. Ensure that the device has an electrical safety switch installed. Make sure there are no hard or sharp objects nearby that could injure children while using or exiting the castle. More information about jumping castle risks and safety measures can be found at WorkSafe Victoria and at SafeWork. To obtain copies of the Standard, go to the Standards Australia website.